All of our teen classes are at least five weeks long, with 30 hours of class time (divided into 15 two-hour classes), 4 hours of AAA Zero Error Driving Program (scheduled either in a separate 4 hour session or starting in the fall it will be added onto the classroom sessions so it will either be 15 sessions that are 2 hours 16 min. long or 17 sessions that are 2 hour long classes), five one-on-one driving lessons with an instructor, and one observation drive (where the student sits in the back and observes another student and instructor doing their drive). We will ask that students try to get three of those drives in before the last class, but the important thing is that all the student’s drives and classwork (including any make up days or test retakes) must be done by the student’s deadline. The deadline is three months from the first day of class. Upon successful completion of the course, including all required tests and activities, and upon the payment of tuition and fees, the Department of Licensing will be electronically notified that a student has passed our course, which must be done prior to obtaining a driver license. We will notify students via e-mail upon completion of our course. This notification to the Department of Licensing typically takes 3 to 4 weeks after all requirements are met. If you need expedited notification service, there will be a $50 rush fee charged. Personalized, physical certificates, if desired, can be ordered for $25. Once you’ve received the course completion email you can schedule your Maryland MVA State. There’s no need to wait until you’ve had your permit for 6 months or your 16th birthday. It’s best to take the tests when the information is fresh in your mind. You will receive a discounted testing package price in the course completion email (some conditions apply). Do I get a certificate if I complete the class? Am I required to have a Learner's Permit to take the class? 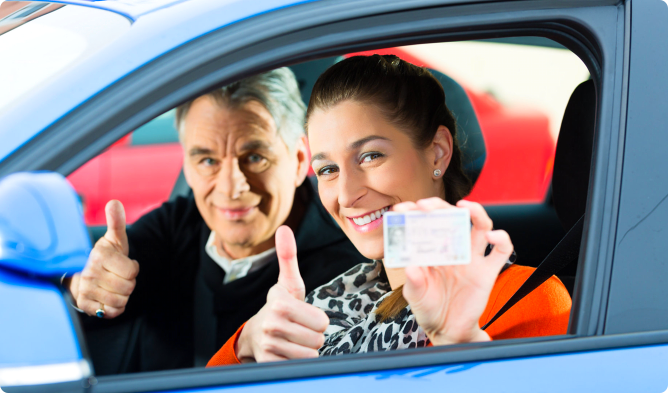 We offer a 10 hour Learners Permit Prep Course to help prepare students for the Maryland MVA learners permit test. This course is open to all students, yet designed by a Special Education Teacher to help students who require additional supports. Call for more information 240-567-1895 or see Schedule/Cost Tab. Students must successfully complete all 6 hours (three 2-hour lessons) of the behind the wheel portion of the Driver Education class before completion data can be submitted to the MVA. Success is determined by completion of all 6 hours satisfactorily. Instructor discretion is used for students earning an unsatisfactory on any of the skills. If an Instructor sees that a student may not pass the behind the wheel portion, he may recommend that the student defer his/her 2nd or 3rd lesson in order to have more practice driving, thus having a better chance of passing. This practice may be with a parent or mentor, or they may take Driver Improvement Lessons. If a student fails the behind the wheel portion, they must practice (this can be with the school or a parent/mentor driver) and then arrange with the school to re-take the failed lesson. Any lesson outside of the 6 hours included in the course is at an additional charge.